We are very excited to announce that we are now offering digital dental radiography right here in our hospital! Did you know, that more than 80% of cats and dogs will show some form of dental disease before the age of 3 years old? With this new diagnostic tool, we will be able to identify signs of dental disease early, and hopefully before it causes serious problems in your pet’s mouth such as bone loss or abscesses. 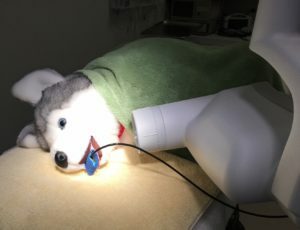 When your pet comes in for a complete oral exam and dental cleaning under general anesthesia, we will be able to take a series of images, similar to how dental radiographs are taken on humans. We use a small plate which is inserted into the mouth, and the radiograph is sent to the computer where we are able to then analyze the tooth roots, pulp cavity and surrounding bone. Dental disease is caused by bacteria which gets underneath the gumline and secretes toxins which are damaging to the tissues. Some animals may have signs of dental disease, such as red or receding gums, bad breath, or loose teeth. However, there are often few outward signs of dental disease, which is why we recommend every pet having a complete oral exam, dental cleaning, and dental radiographs to help us to see if there is any disease below the gumline or within the tooth. Dental radiographs are also used during oral surgery to determine the root positions, assess bone loss and plan the best approach. Afterwards, a radiograph is taken to insure the root removal is complete. Having a full set of dental radiographs is also establishes a baseline of their dental status, which can help guide future treatment recommendations. Please call our office to schedule a dental consult for your pet at (860) 669-9374!